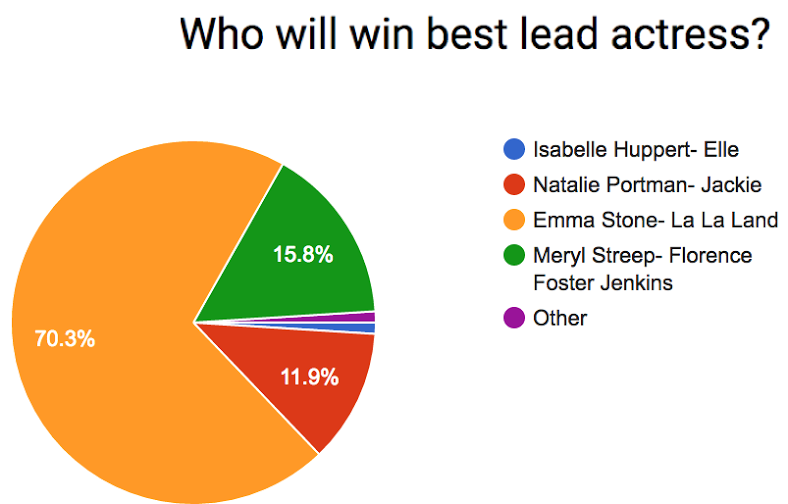 Over 100 Hopkins students weighed in with their Oscar predictions and we were able to develop an idea of who should win. However, the results may reflect the fact that much of the student population only watched La La Land. At Hopkins, there was an overwhelming majority of votes for Ryan Gosling as best actor. La La Land received 14 offcial nominations, a feat only ever accomplished by past movies Titanic and All About Eve. 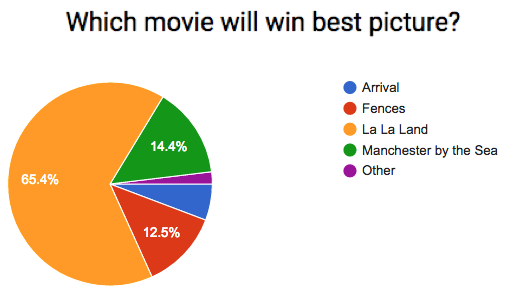 The Razor staff polled the Hopkins community on their predictions for the Oscars. Every year, directors, actors, songwriters and producers wait in anticipation to be nominated for Hollywood’s most coveted awards: the Oscars. This year, the 89th Oscar nominations feature La La Land. The film, starring Emma Stone and Ryan Gosling, has received fourteen official nominations, a feat only ever accomplished by past blockbusters Titanic and All About Eve. In addition, Fences, Moonlight, Moana, and Manchester by the Sea have all received high praises. Hopkins also brought home a nomination with alum Nicholas Britell ’99 receiving the nomination for Best Original Score of the movie Moonlight. Though some movies came away with multiple nominations, other movies were not as lucky. Martin Scorsese, a favorite to win Best Director for the movie Silence, shockingly failed to receive an Oscar nomination, as did Tom Hanks starring in Sully. After two years in which the Academy failed to nominate a single black actor in any of the four acting categories, the nominations this year are noticeably more diverse. Six black actors and actresses in four different films were nominated -- a record for the Academy Awards. Denzel Washington and Viola Davis were nominated for Best Lead Actor and Best Supporting Actress respectively in Fences, and Mahershala Ali was nominated for Best Supporting Actor in Moonlight. Politics will also play a role in this year’s Academy Awards. President Donald Trump’s executive order will keep Oscar-nominated director Asghar Farhadi from participating in the 2017 ceremony. With the new four-month restriction on travel from select countries, Farhadi will be unable to attend the event to support his own film, The Salesman. On February 26, the Academy, a group made up of over 7,000 filmmakers and cinematography professionals, will make its decisions and award a single Oscar in each category. Eager fans wait in anticipation for their favorite actor or actress to win the honor of an Oscar nomination. Hopkins students also eagerly expect the Oscars to either confirm or disprove their predictions.